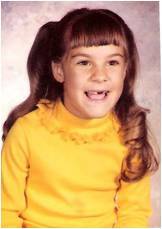 I kept my hair pretty long as a kid, and I wore it in one or two ponytails most of the time (when it wasn’t in braids). I have thick, thick hair, straight as can be. Any curls needed to be strong enough that they would hold up to the weight of my hair. My mom, who wanted her little girl to wear big, full curls, especially for pictures, would either fill my hair with curlers at night before bed so that I would have springy curls by morning, or devote time before school to working a curling iron through my hair. Picture of me with curls in my hair. My mom and I didn’t know about the competing effects of weight, elasticity, tension and “swelling pressure,” that together needed to reach the right balance in order for those curls to stay in place. 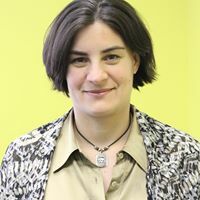 But a group of physicists in England has studied the interplay between these effects on bundles of hair, developed a mathematical theory that can predict the shape of a ponytail, and published these exciting results in a high-profile scientific journal. Let’s look at that publication and see what we can learn about both ponytails and scientific papers! The abstract of a paper is a short synopsis at the start where we hear about the most exciting parts of the paper. We learn that they are going to reveal a “remarkably simple” equation describing the shape of a ponytail, and that they verified the validity of their equation with lab measurements. That’s right, they carried out experiments on ponytails in a scientific laboratory. Let’s read on. Where does this study fit into the world’s body of knowledge on hair? 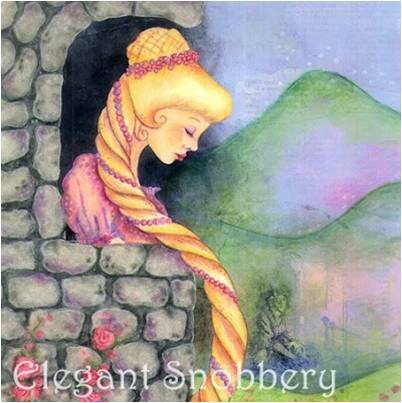 In the introduction, the authors provide us historical context, evoking Leonardo da Vinci (who opined on the best way to illustrate hair), as well as Brothers Grimm (authors of the storybook tale Repunzel). Despite the influence of hair in both art and science throughout history, they argue, it is then surprising that the physics that determines the form taken by a ponytail remains an open question. They tell us about a previous paper on a related topic: someone by the name of van Wyk studied the compressibility of wool way back in 1946. Repunzel, from the Brothers Grimm fairytale collection,would let down her hair for the enchantress below (picture from tootsiegrace.blogspot.com). Now that the authors have educated us in human hair properties, we know enough to tackle the rest of the paper. Next the authors go through the steps to derive the “Ponytail Equation,” starting with a set of assumptions. First, let’s imagine that in the middle of a thick ponytail, you could insert an imaginary bubble, and count how many hairs enter the bubble and how many leave the bubble. If none of the hairs end inside the bubble, then the number entering and the number that leave should be the same. This is analogous to the “continuity equation,” which is used in the study of the physics of liquids called “fluid dynamics,” and it is the first assumption in their ponytail derivation. Next, the authors account for all of the energy in a ponytail bundle. It includes the elastic energy, or springiness, of the hair, the gravitational potential energy, and a confinement energy, for example due to the hair being tied by a band. In the next step of their derivation, they find the ponytail shape that makes the hair bundle contain the smallest amount of energy. Any system wants to go to a state of least energy, for example when you put a ball at the top of a hill, it wants to roll down. The ponytail equation is summarized nicely by the plot below. There are four forces acting to balance a ponytail. The horizontal axis tells you where you are along the length of a ponytail, with the hair restraint at s=2 cm. The vertical scale tells you the strength of each force. 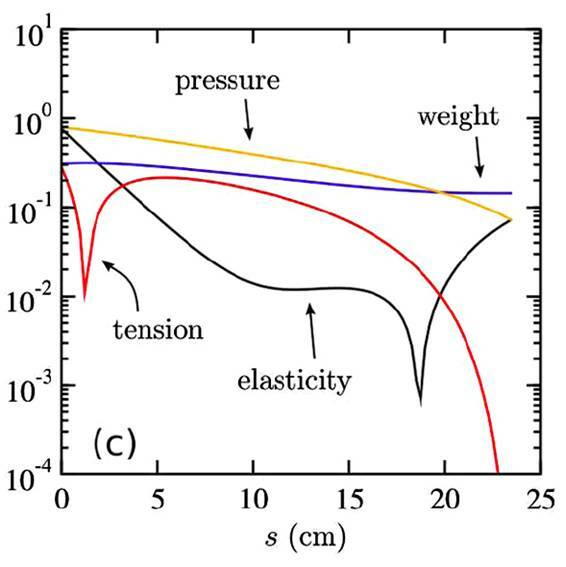 Near the hair restraint, the pressure due to the hair band is the same as the elastic force of the hair pushing back (the yellow and black curves are the same height). For most of the ponytail length, however, the weight is the strongest competitor to the pressure. The tension of the hair is small compared to the other forces (take a fallen hair and try and stretch it along its length – the tension force is what pulls back). Results from the ponytail publication, showing the different forces acting along the length of the ponytail (the horizontal axis). On the vertical axis is the strength of the force. The ponytail equation must be able to describe the ponytail data if it is to be regarded as a good theory. 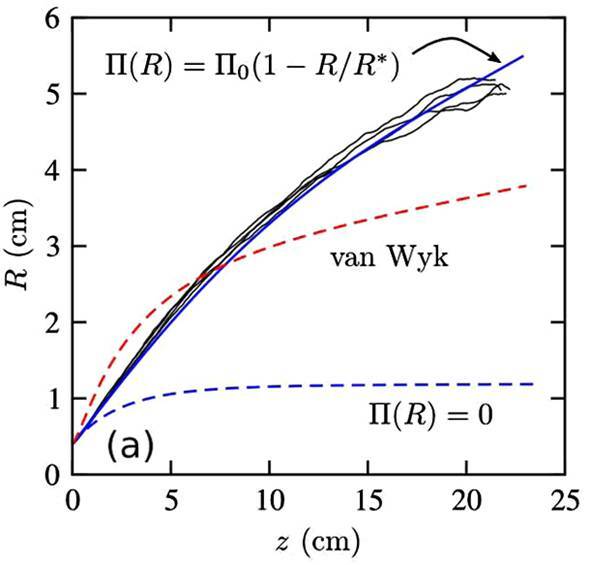 In the figure below, the authors show that their ponytail equation (solid blue line) does agree with measurements of ponytail thicknesses at different lengths (solid black lines). The new equation describes the data much better than the one derived by the van Wyk character who studied sheep hair (dashed red line). The ponytail equation matches the experimental data! Finally, the authors remind us that there is lots more work to be done on understanding hair. Their work can be extended to study other hair and fur geometries. Imagine the possibilities! In addition, their theory can be used to understand hair motion. They end with a tantalizing reference to a paper that investigates why a ponytail swings left and right while a runner bobs her head up and down. I grew up in Cincinnati, Ohio and went to college at Purdue University in Indiana where I found out that I love physics. Since then I have lived Indiana, California, Chicago and England. Now I am back in Ohio where I have been a physics professor at OSU for nearly 3 years. I work on experiments that use radio antennas in Antarctic Ice to search for particle arriving here from deep in space called neutrinos. I am so fortunate that learning new things about the universe is my job. I also enjoy growing vegetables, and being really silly with my 3 year old.